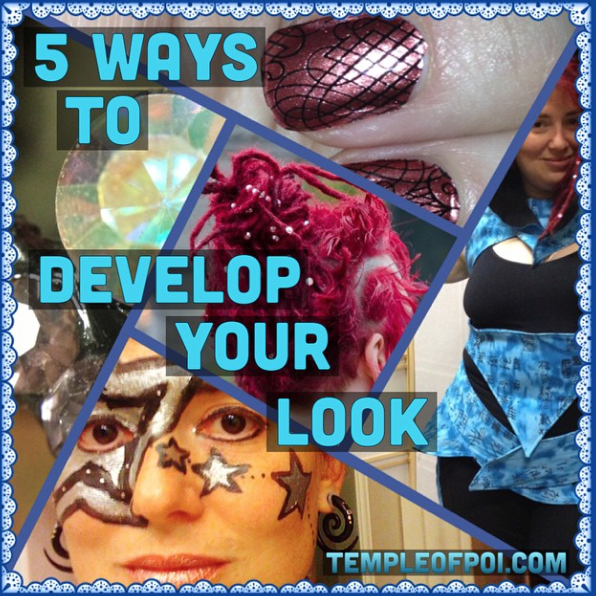 How did you come up with your look? Especially when you’re performing with fire. Didn’t you feel limited in the beginning? Just curious about your process. Costumes. This is likely an obvious first go to place when becoming a performance artist. Costuming can definitely separate the professionals from the amateurs when the amateurs don’t take the time to make this investment. To start with, you need one costume, though I really think 3 is a better starting number so you can gig all three nights of the weekend and have a unique costume for each which can come in handy when you do gigs with multiple runs. Here are some one of a kind original costumes from us to give you some ideas. Those costumes are almost exclusively fire safe — it’s just more cost effective. (To commission one of your own, contact GlitterGirl or comment on this blog post.) 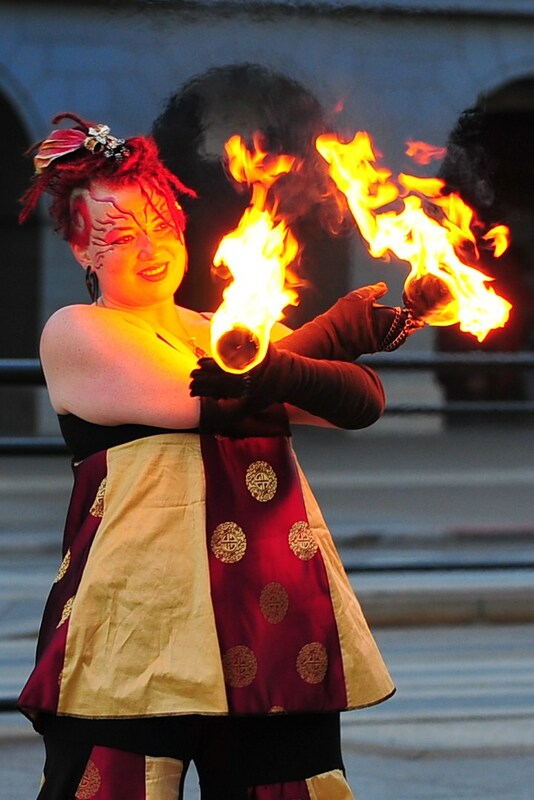 If your’e looking to make something on your own, check out the article, 10 Tips for Making a Fantastic Fire Costume, I highly recommend it as a jumping off point for your creating process. But in the beginning, you may be looking for the cheapest route to get to something kinda cool looking that’s also fire safe. Makeup. Makeup can really help create a finished look though in some cases, it can be the entire look. I’ve seen artists use airbrush techniques to cover the body and the airbrush paint becomes the costume itself. Of course, we don’t all have an airbrush sitting around so a somewhat cheaper and likely more accessible solution is face and body painting. I’m a big fan of Kryolan Aquacolor, especially since they have a branch here in San Francisco. Their product feels light on my skin and I don’t break out in rashes after using it. Plus, it lasts a really long time which is somewhat surprising considering it’s water based. It doesn’t work so well on really sweaty people but I can pull off a light sweat and the makeup remains pretty fresh looking. This is its own skill and you can start out small and get more complex as time passes. Body modification. Body modification includes head hair, facial hair, body hair, nails, piercings, brandings and tattoos. How you choose to style and color your hair, trim your beard, groom your eyebrows and other body hair impacts how you show up as a performer. I even saw photos on Facebook recently of folks with dyed arm pit hair! It’s certainly a look. Body piercings can lead to all kinds of cool jewelry to be used in the piercings which can really inform your look. And branding and tattoos are two ways of adding permanent color to the body to change the appearance as well though you can certainly do it for a more limited time frame with henna. Accessories. I doubt anyone will be surprised that I love to accessorize with glitter and rhinestones in my hair — an obvious choice for GlitterGirl, no doubt. I also enjoy adding rhinestones to my costumes to carry that glittery look all the way down my body. It’s that extra bling that brings a cool lens flare in photos or when the flash goes off on stage. Other accessories include jewelry, belts, shoes, satchels, walking sticks, hats, gloves, gauntlets, leg warmers/spats and so much more. Who knows — maybe you have suspenders on every time you perform. Presence. As we take on different characters as performers, part of what sells the character is the presence with which we project the character to those watching. This shows up in facial expressions, body language, posture, gait and all the other ways in which one presents themselves from tone of voice to micro gestures in the body. 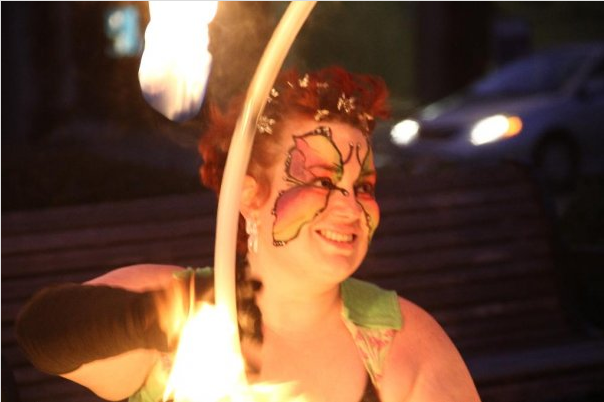 If you’re looking for deeper information about fire dancing performance concepts, sign up for a private session with GlitterGirl now or check our articles.